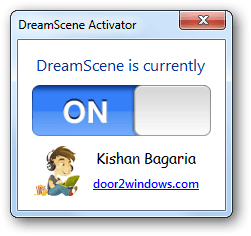 DreamScene Activator is a freeware from door2windows that allows you to activate DreamScene in all editions of Windows 7 & Vista. This is the only freeware on the web that has the desktop text bug fixed. DreamScene is a feature that allows users to set any video in WMV/MPG format as the desktop wallpaper. This feature was only included in Windows Vista Ultimate Edition. Compatibility: This app doesn't work with Windows 10, 8.1 or 8. Click the slider. Wait until it says ON. 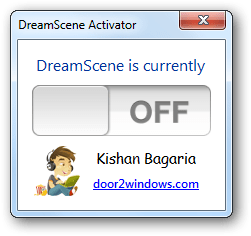 Right-Click on any video in WMV/MPG format and select Set as DreamScene. If you have run this app for the first time then restart your PC. Now the video that you selected will be set as the desktop wallpaper. The audio will be disabled by default. 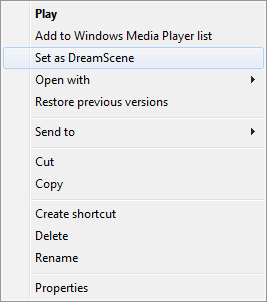 If you want to play it too, visit this tutorial: How To Enable Audio In DreamScene. You can find nice DreamScenes here.